Organizing My Clutter & A New Toy! I apologize for being missing in action while I purge, organize and redecorate my den into an Organized Clutter friendly space. Stuff needs to go! Just a reminder, I work at a real estate title company, create and blog. And it has gotten away from me. So bring in some crates, purge, paint, and let's get organized! I am re-vamping our den as a guest room/craft room. The room is 16 1/2" x 22 1/2" so it has possibilities. Stay tuned for the makeover. 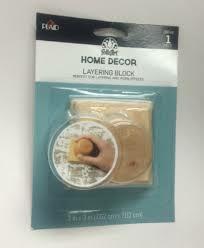 This Folk Art Layering Block will play a large part in the makeover! Busy lady and looking forward to seeing your organized room! This will be a great space...looking forward to seeing it, Carlene! I know it will be a great space when you're finished! Can't wait to see the transformation. I know it will be wonderful!! Inspire me, please! Can'take wait to see your results. Nice big space, can't wait to see what you do with it, whatever you do I know it will be fun and unique. Honestly I don't know how you do all that you do. I at one time worked full time and had antique booths, but I just mostly cleaned the stuff up every once in awhile I would refinish or paint a piece, but that was rare and I didn't have kids at home so for me it was a lot easier. You must have endless energy anyone can look at your yard and tell you spend a lot of time in your yard, work full time and blog, take care of your family. whew I'm tired just thinking about it. My Hats off to you and can't wait to see your new room. Good luck with your organizing.....it always makes me feel good when I get an area straightened out! it will feel good and look great! I don't know how you do it all working as well! No apologies necessary! I hear ya and I'm doing the same thing. Not so much organizing, just purging. Lots of purging. Looking forward to seeing your new creative space.